Tourism New Zealand wants to get visitors out of Auckland and into the regions. Auckland Tourism wants to keep them in Auckland. FlyStark has figured out how to do both. 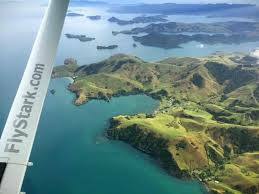 With tourism now the single biggest earner for foreign exchange in New Zealand, FlyStark has its finger firmly on the industry’s pulse, plucking tourists out of Auckland and taking them on scenic tours and chartered flights around the Waikato, Coromandel and Auckland regions as well as Great Barrier Island, then returning them to Auckland. FlyStark’s services provide day-trip flights for visitors staying in Auckland who want to see the regions without spending time navigating New Zealand’s tricky roads by car. Mr Stark says removing driving from the equation not only saves time but offers a unique perspective to common tourist spots - “Hot Water Beach is unbelievable from the air”- as well as sharing the tourist dollar between Auckland and the regions. Mr Stark gives an example of a recent trip FlyStark provided for a group staying in Auckland and wanting to do the Tongariro Crossing. As well as scenic flights, FlyStark provides chartered flights and pick-up/drop-off services.